Born to a methodist teetotal father in Ardwick, Manchester, Ellen Wilkinson was one of only a handful of female MPs during the 1920s. Not only this, but she also came from a working class background with a father who faced several periods of unemployment and a mother who suffered long bouts of illness (she died when Ellen was 25). Eventually her father gained employment as an insurance agent, cycling around their town collecting dues, and trying to ensure families gained financial support when needed. Educated at Ardwick Elementary Grade School, Ellen was initially asked to stay on as a trainee teacher – even though she was just a few years older than her charges. During her first term she noticed her pupils were bored stiff, marking time until they could leave at 14. She therefore set out to teach them Addington Symond’s The Renaissance until one day she was interrupted by the Head who wanted to know why the students were no longer sitting still with their arms folded. Ellen haughtily responded: “They are sitting that way because I am interesting them”. Soon after, she was asked to leave her teaching post; the Head advised her that ‘missionary work’ might be more appropriate. From 1924 until 1931 Ellen was MP for Middlesborough East. One of only four female MPs, the women were forced to share a single office, they could not eat in the dining room, and the one toilet reluctantly provided to them was a quarter mile walk away. After losing during the 1931 election, Ellen later took up a seat in Jarrow where she worked tirelessly on domestic issues air raid shelter preparations, pensions, stopping ‘pay day loans’ (reminiscent of the lenders currently in contention at present). Despite her deep reservations towards Attlee as Labour leader, he still asked her to take the role of Minster for Education in his 1945 Cabinet. She was the first women to take the role, and only the second woman to enter the Cabinet. During her tenure she introduced free milk for all students, relentlessly pushed through the raising of the school leaving age to 15, and helped found UNESCO. Plagued by illness through the last months of her life, Ellen died in February 1947. The coroner ruled that her death was caused by heart failure as a result of a drug overdose. The verdict stated that the overdose was accidental. Is she a contender for ‘greatest’ ever education secretary? Her status as the first female Education Secretary, plus her working class roots and exuberant personality mean that Wilkinson is fondly remembered. 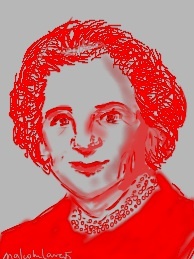 Unfortunately her short tenure, coming as it did during a financially tight time, plus her alleged ambivalence towards the ‘comprehensive ideals’ of the 1944 Education Act mean her contributions to education may not ultimately stand up to measure.